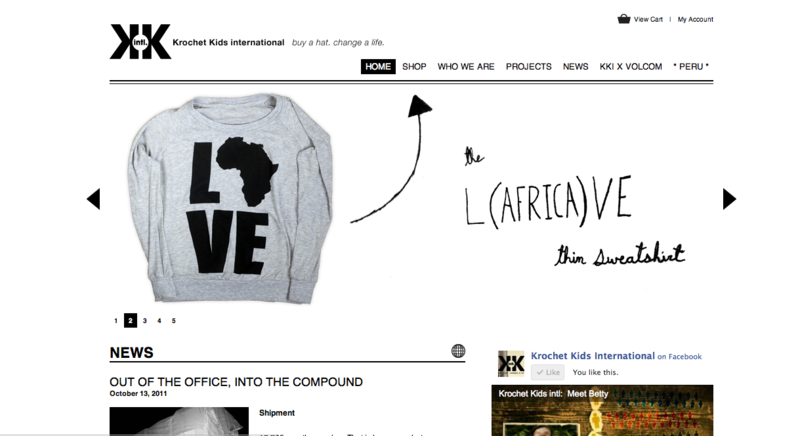 Krochet Kids is a non profit oranization that sells hats to empower people to rise above poverty. Their mission: To create sustainable economic development programs that support holistic growth of individuals and communities within developing nations. To inspire the knowledge of a generation about their ability to bring change to a world that is in need. Design mixes and balances visuals and information on a very clean, simple layout. Somewhat dynamic design, combining pics and videos. Lots of pictures of people and the products that are helping those people- emphasizes the non profit ventures. Big distinction between their ecommerce portion and non profit informational section. Geared towards women, men, children, anyone interested in buying a knit product or support projects. The branding is specific to younger 20 somethings who are looking for causes to be passionate about, and like trendy knit wear. Also, with the partnership in Volcom, the skate and surf community will also be taking notice of Krochet Kids. Both the business and site goals are to 1. Sell merchandise, 2. fundraise through donations and purchases, 3. Spread the word about the organization, 4. Strengthen brand awareness and broaden community. Krochet kids lists a Facebook (equipped with “like” button), a Twitter account, availability to comment, and Youtube and Vimeo Links. The site is organized through well-defined section, and it combines features from e-commerce sites, such as catalogue type “Shop” section, in which the products made by people in developing countries. Each section also has a scroll-down menu linked to subsections, whether e-commerce style or related to the projects they are working on at the moment. Krochet Kids displays a strong brand image to persuade consumers who are brand conscious to be a part of the movement, proceeds would not be as abundant without strong brand management- ex twitpic tuesdays– displaying consumers with their trendy new hats.